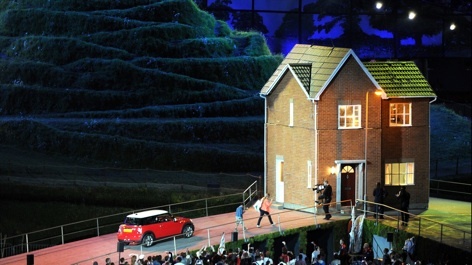 The London 2012 Olympics opening ceremony required a great deal of innovative — but hidden — engineering to make it work. Stephen Harris spoke to the engineers behind the spectacle. 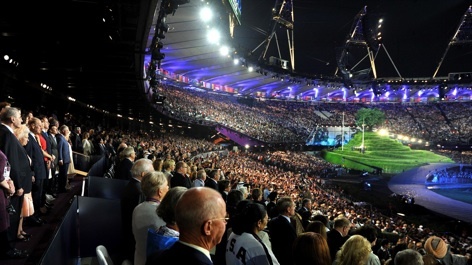 The London 2012 Olympic Games showed off British engineering at its best, from the sweeping designs of the Olympic venues to the rising importance of sports technology in training. But engineering was also vital in bringing to life an opening ceremony that blew away the nation’s cynicism and set the mood for what some international commentators around the world have called ‘the best Olympics ever’. Working on a home Olympics also enabled an unprecedented level of co-ordination between the ceremony’s technical team and the Games organisers from the very start. Shepperd was brought on board back in 2006 — several years before the stadium was even designed — to advise on what was needed to make the ceremony a success. He then worked closely with the engineers at Sir Robert McAlpine and Buro Happold to ensure that the stadium would be ready for whatever demands the artistic team came up with. In particular, this led to a roof design that could support a huge cable-net system (see box), which allowed the ceremony team to fly in scenery, lighting and performers with ease and saw the introduction of panels of light-emitting diodes (LEDs) behind each seat in the stadium, which turned the audience into a giant display screen with greater resolution than ever seen before. When the first details of the opening ceremony were revealed — including the 40 sheep, 10 chickens and three sheepdogs that were to appear — it sounded as if landscape architecture and husbandry would play more of a role than engineering. But the introductory sequence of a ‘green and pleasant land’ — a romanticised scene of pastoral British life — created a unique challenge for the technical team: the rapid removal of 7,346m² of real turf. Not only did they need to find a surface that would be safe for people to dance across when it had previously been covered in potentially rain-sodden soil, but they also had to co-ordinate more than 2,000 cast members in the ripping up of the grass to reveal a stage set for the coming of the Industrial Revolution. This was just one example of why 8,000 radios were needed, so the stage manager could constantly distribute instructions to make sure everyone was in exactly the right place at the right time. With the grass removed, the stadium was transformed into a representation of industrial Britain led by Victorian engineer Isambard Kingdom Brunel (played by Kenneth Branagh), complete with beam engines, textile looms and seven chimneys reaching up to 30m in height that appeared to rise from underneath the stadium. Although the chimneys were very solid in appearance and each weighed more than one tonne, they were, in fact, inflatable and were filled by fans beneath the stage. Each chimney was rolled via tracks onto a lift in the stage floor and then hooked onto the cable-net system above the stadium. ‘As they’re inflated they’re actually pulled up by the aerial system at the same time as the lift is co-ordinated, so when the chimneys are fully elevated the lift is flat with the finished floor level of the stage construction,’ explained flying technical manager James Lee. A winch with a slip clutch attached to the top of the chimneys and pneumatic dampeners at their bases kept them taught, ensuring they inflated from the top and securing the illusion that they were solid structures rising from the floor. 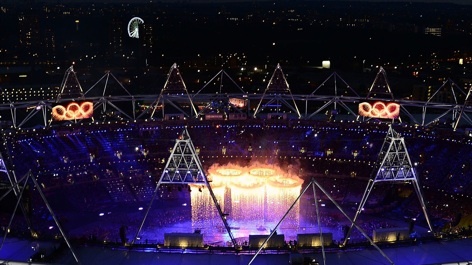 Next came the ‘forging’ of the giant Olympic rings, which were filled with LEDs to make them glow like molten steel. As one rose from the centre of the stadium, another four flew in from platforms on the roof, positioned precisely to overlap to form an Olympic emblem in the sky. This required some careful programming to compensate for up to 3.5m of deflection in the aerial cables due to the changing loads on the system, which was also controlling the chimneys. ‘You had to make sure you had included all the loads at a particular time on the system, because if one load wasn’t there it would give it a different result so the rings would hit each other,’ said Lee. The process then had to be repeated in reverse to clear the stage while the audience were busy watching ‘the Queen’ and James Bond prepare to parachute into the stadium. In the next sequence, 32 Mary Poppins characters descended from the sky to do battle with giant puppet versions of villains from children’s literature, while hundreds of NHS nurses danced with 350 beds that lit up with battery-powered LED quilts. Here the cable-net system came into play again, said Lee. ‘The 32 of them were actually loaded from the roof on platforms on four different lines, eight per line.’ At the same time, five ‘dementors’ from Harry Potter took off from the floor travelling at 3m/sec, carefully controlled so as not to collide with anything. And more aerial lines were used to control an 18m-high Lord Voldemort puppet that fired pyrotechnics from its wand. As with the chimneys, an under-stage lift and fan were used to inflate the 2m-diameter air beams that made up the house’s skeleton structure. This was covered with lycra to provide a surface onto which 22 projectors positioned around the stadium displayed famous images from British film and TV. At the end of the scene, a smaller house built from foam over a lightweight steel structure was erected. It was so large it had to enter the stadium in two pieces, the top half being lowered via the cable system onto the bottom half that was rolled in, before the whole thing was lifted again to reveal the British inventor of the World Wide Web, Sir Tim Berners Lee. 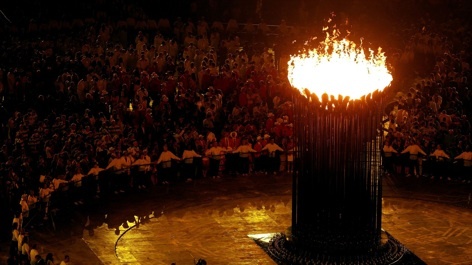 After a tribute to the victims of the 7/7 London bombing, the athletes’ parade and the official opening of the Games, it was time to light the unique Olympic cauldron, designed by Thomas Heatherwick. 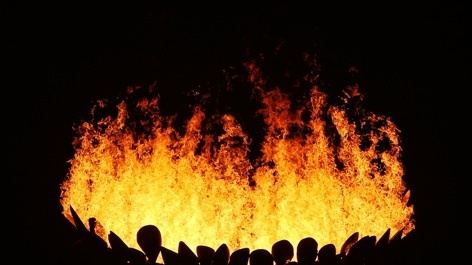 It consisted of 204 metal ‘petals’ representing each of the competing nations and each holding a gas-powered flame. These sat on stalks that initially stuck out horizontally but gradually rose as the petals ignited one by one, eventually combining to form a cauldron carrying a huge ball of fire. ‘It was a beautiful object and brought together a number of different technologies,’ said Shepperd. ‘There was the automation in terms of the motors making it move, obviously a very complicated ignition system and then an awful lot of finishing on it. Thomas was very keen right from the early stages, that the mechanics of the machine should be exposed and not covered up.’ The other challenge for the technical team was storing the 23-tonne cauldron under the stage, ready for it to rise up for the lighting ceremony. This meant building the spines to rotate as well as rise so it could be collapsed to the smallest possible size, before being positioned on a 18m-diameter lift ready to appear. With all this clever engineering, the technical team is understandably proud of their contribution to an event that did an awful lot to raise the country’s spirits and perhaps will influence how the UK is viewed abroad. Soon the eyes of the world will be back on Britain once more for the Paralympics, opening next week. The Engineer was keen to know what that event’s opening ceremony would look like but Shepperd refused to give anything away. ‘You’ll have to wait and see but I’m sure it will be spectacular,’ he said. The aerial cable-net system played a major part in enabling the technical team to realise the creative ideas of the opening ceremony. It consisted of 14 radial cables attached to the stadium roof and meeting at a central hub, each carrying two trolleys that could run independently to move scenery and performers around and lower them onto the stage. Underneath was a another pair of cables running the length of the stadium, each carrying two further winches that allowed the team to position other objects such as a raincloud at the start of the ceremony, a sun during the 7/7 bombing tribute and a flying bicycle fashioned to look like a dove just before the cauldron was lit. The 21012 games wear beautifully done. The entire team hit a home run on this one. England is certainly to be congratulated. Well done. This was a really interesting article. Anyone who watched Danny Boyle’s STUNNINGLY brilliant show must have wondered how it was done from an engineering point of view. Thanks for the griff! An excellent article with a very clear explanation as to how the engineering in support of the opening ceremony was organised. Should this explanation be used in our schools and further education to enthuse children to become the engineers that we need to service new productive assets and grow our economy? What a great article explaining how engineering played a pivotal role in the London 2012 Olympics Opening Ceremony. Being a ceremonies volunteer performer I marvelled at it all through the rehearsal process and was completely spellbound on opening night. Simply magnificent. Do you know of any British companies that are involved in the opening or closing ceremonies for Rio 2016, as I worked on the 2012 closing ceremony in London and would love to work in Rio. I just come across this amazing article and boy memories suddenly came back so strong I even dropped a tear. I was amongst one of the crew that for 12 hours every night for two months leading to the opening have worked at the tuning, cleaning and problem solving of the cauldron machine. I could fill 10 pages of this site with all sort of stories. We had to work at night cause this machine was the best kept secret of the whole ceremony, it was so secret that at some point we started noticing helicopters arriving around 3am and idle in the air for sometime and then disappearing. We originally thought that the BBC was already trying out scene and equipment. Reality is that the helicopters were hired by the Mirror, The Sun etc etc and they were publishing quite horrible but revealing pictures of the machine in its infancy status. The civil aviation had to intervene declaring the space over the stadium a non flying zone. It would take anything between 3 and 5 hours to undo al 204 arms forming the machine, It was a carefully executed opening as if a single arm was not opened in its sequence would jeopardies the opening of the remaining arms, for many many night we did just that and opened the arms in the wrong sequence, causing breakages, oil spills and mountains of metal junk. Danny would turn up most nights at around 3 or 4 am making sure that things were progressing, clearly marking the machine as one of the wonders of the opening and adding to the nature of the stress, there was no failure option of any kind when over 4 billion people are watching the machine appearing from nowhere and with such a grace. I remember the first night the main pipe fuelling the system was attached to the Cauldron which until that point was tested with water. The fear that somewhere in any of the 1000s of junctions, nodes, stunts, bypasses a lick of gas would render the machine unusable was great, the fire brigades in attendance, the whole of he area cordoned the main valve of the pipe line gets opened, the injectors fire, liquid start coming out the end of the tubes where eventually the petal where attached, but no sign of fire, eventually after the main pump had emitted a rant the system shut down and we all looked at each other with a sense of dismay. It was only when the gas master approached the machine and started swearing in all languages we realised the worse may had happened. The machine 1000s of seals had been replaced from the rubber type used during testing when only water was run with the appropriate gas seals in an exchange lasting over a week as every single nuts and bolts had to be undone and redone times 204. What none of us was ever informed was that the pipe that we had carefully kept closed so not to send impurities in it was the very first thing that was ever built in it even before the stadium was built that pipe was laid under 4 mt or rubble and it was coming directly from one of the main gas silos 2 miles away from the stadium. at some point during construction the pipe must have been left opened and with no one knowing what and why it was there is was left to fill with all sort of stuff, but mainly with water. That night we were all extremely lucky as the system shut down for the very reason that small detectors running all the way from the silos to the machine had picked up anomalies and the main anomaly being a ball of gas send through the pipe at untold speed had collided with tonnes of water in the pipe and the whole conduct was about to go in a major explosion who would have declared the beginning of the end of the Olympics as it was running across and beneath the very foundation of the seating areas. I stop it here, I did say I could fill up 10 pages on this site. I too was a Games-Maker and whilst I did NOT attend then Opening Ceremony, I know a man who did! I did seek to arrange for the ‘symbolic Looms’ -part of the Industrial Revolution sequence to be installed at the National Trust Quarry Bank Mill. Sadly they had been scrapped before they could be available. We got to see the dress rehearsal -stunning in itself- and I still occasionally watch the Opening Ceremony Video -perhaps the finest examples and recommendation and encouragement to young folk to consider a career in Engineering. I use that sequence in my ‘STEM’ and other lectures to students: Interestingly, the chimneys in the sequence are round: that at QBM was eight-sided: here was a Victorian industrialist Samuel Greg demonstrating class: he did not want an ordinary chimney, he wanted one -probably the highest in Cheshire then -and taller that most Church spires -to show his wealth, power and status. A cathedral to commerce, not to religion. Though what the apprentices, who worked from 0600 to 1800 (just for bed and board)-the alternative was the work-house) thought is not known! Was fascinated to read Luca Gatti’s comments: what a wonderful thing to be a part of: definitely part of his family folk-law.